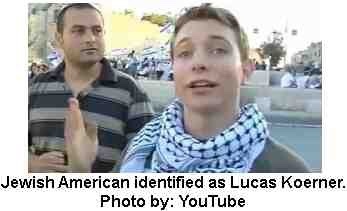 “Lucas,” a 19 year-old from Philadelphia, cut a rather different figure in the Jerusalem Day flag parade in the capital. Like many participants in the event, he wore a skullcap on his head; unlike the others, however, a Palestinian flag and a keffiyeh were also part of his outfit. Bill, I bet this is just the sort of Haaretz report you’re good at finding. I expect that if we’re going to wear anything, we should wear icons of both Palestine and Israel. Good idea! I subscribe to the online edition of Haaretz. It is one of the more progressive news sources in Israel. I don’t think any other Israeli paper would have a journalist of Amira Hass’ caliber on their editorial staff. She receives lots of hate mail for trying to give a voice to the Palestinian people.